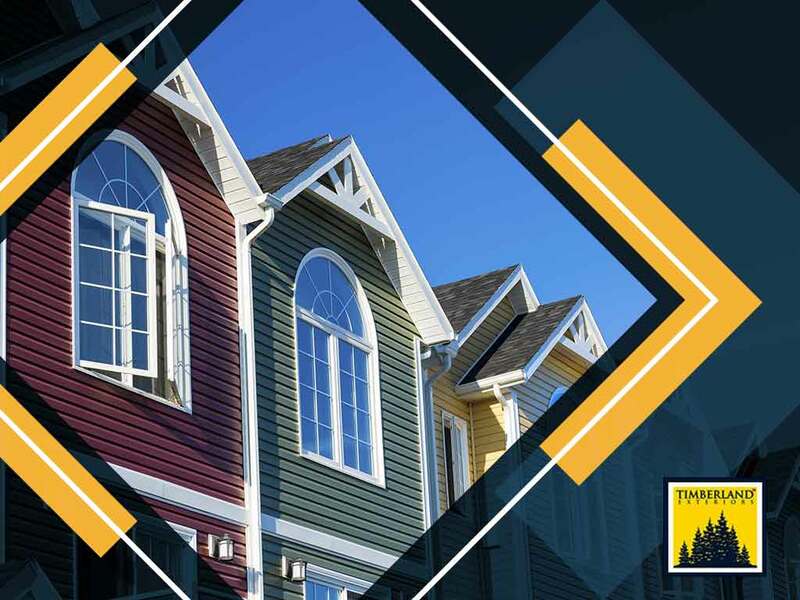 Thanks to the wide selection of color options offered by manufacturers such as Owens Corning and James Hardie, you can have virtually any exterior color combination. Modern style homes have a particular look that requires certain color combinations. Exterior remodeling contractor, Timberland Exteriors, recommends trying the following when planning your own modern exterior color palette. There’s no better study of contrasts than stark black and white, and you might be surprised by how far you can take this combination without your home looking like a line drawing. As with any other color combination, it’s important to choose a main color and another as the complementary color. In this case, white is ideal as the main color for many reasons: it looks clean, elegant and it doesn’t absorb too much heat. Black window frames, trim and other elements add depth. This combination also brings out splashes of color, such as landscaping, or perhaps a bright red front door. A monochromatic color scheme uses varying degrees of a single color to create texture. For example, you can choose deep blue siding against a navy blue roof, with pastel blue siding and trim. Many consider monochromes as a tricky color palette to use, but it can be rewarding with the right combinations. Be careful to choose a color palette that contrasts with the surroundings. A monochromatic green color palette might render your home almost invisible if your home is surrounded by a lush garden. An experienced contractor who offers residential roofing service, like us, can help you choose the perfect color scheme for your home. Wood can add a warm look to your home’s exterior, and works in most modern home styles. While commonly associated with traditional architecture, like wood shingle siding or stained plank siding, for example – wood panels look perfect on traditional styles. You can choose different stain colors to create contrast, or use wood panels to accentuate a dominant color. Natural materials like stone or brick can likewise be used the same way. To learn more about choosing your exterior color palette, or for our other services including hail storm damage restoration, call Timberland Exteriors today at (651) 404-2330 (St. Paul), (952) 373-5145 (Minneapolis) (218) 366-9433 (Detroit Lakes), or (715) 203-8040. You can also fill out our contact form to schedule a free, no-obligation quote. We serve Detroit Lakes, MN and surrounding areas in Minnesota.